Discover what to expect from a wedding in the Lone Star State. While every wedding celebration is unique, there are certainly some similarities when it comes to soirées held in various areas of the country. Couples like to infuse their own personalities into their nuptials, and it's also common to incorporate local traditions unique to the location where the fête is hosted or even the pair's hometown should it differ from the locale. Southern weddings are perhaps some of the most common celebrations that focus on traditions, so we asked Dallas-based event planners DFW Events to share their go-to activities, snacks, décor, and more for a Texas wedding. Though they plan luxurious events around the world, they have designed countless weddings in their home state, making them experts at a quintessential Texas soirée. While it’s true that we plan weddings and events all over the world, we have to admit that we’re pretty proud to call Dallas, Texas our home base! Everything really is bigger in Texas – including the kinds of parties we throw – so if you receive an invitation to a wedding in the Lone Star State, we recommend saddling up and sending in your RSVP in the affirmative as soon as possible. In addition to Southern sensibilities and a healthy dose of hospitality, you’re bound to encounter a detail or two you’d be hard-pressed to find at any other “I do.” Let’s take a look at nine of our favorites! Sending an invite to one of the state’s most recognized VIBs – that’s a Very Important Bovine – is a more common practice than you might think. 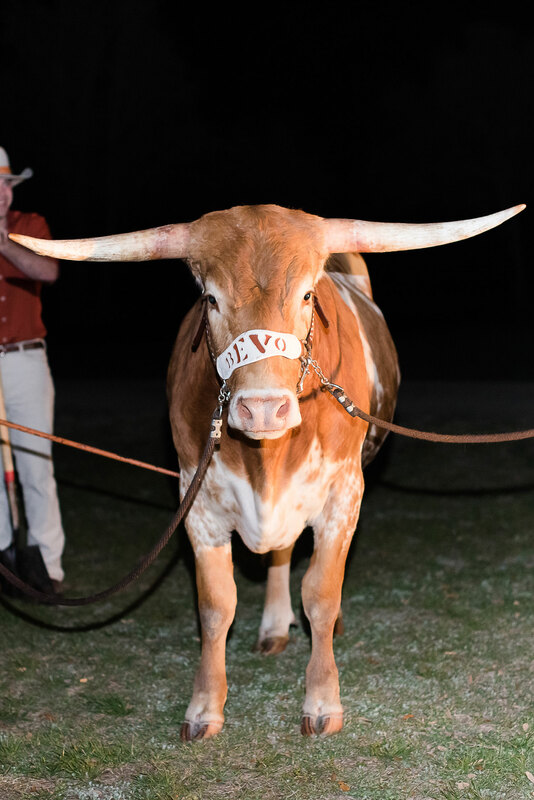 Bevo, the official mascot of the University of Texas, has been known to make special guest appearances at weddings we’ve coordinated throughout Texas. Needless to say, he receives a warm welcome from Longhorn-lovin’ crowds every time. Hook ’em! Late-night snack passes have been trending for a while now, and at a Texas wedding, there’s no finer fare to dish out than Whataburger! Equally appetizing after a Friday night football game or a Saturday night spent on the dance floor, a couple’s most difficult decision is typically which best-selling menu item to serve – Honey Butter Chicken Biscuits, classic Whataburgers, or both! As for washing down that Whataburger, every Texas groom knows that a bartender just isn’t worth his stock unless he’s serving Shiner Bock. The renowned dark lager is produced by the oldest independent brewery in Texas and is always a hit with hometown guests. If you’re lucky enough to be on-hand for an entire Texas wedding weekend, you’re bound to be bestowed with a whole passel of local products upon arrival. This is called a welcome gift, and believe us, it’s always met with a smile. 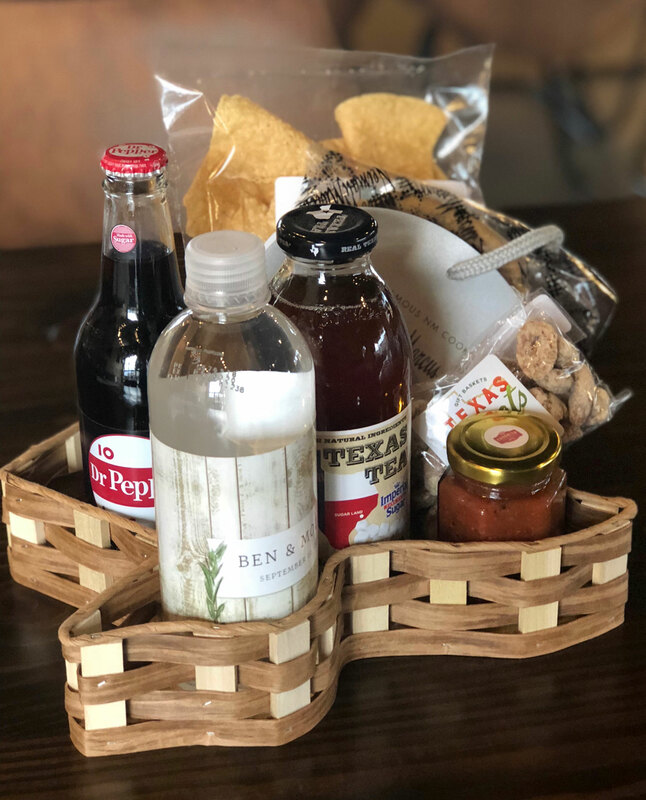 A Texas welcome gift will likely feature a box or bag emblazoned with the shape of the state, pecans (the official state nut), and chips and salsa (a Texan’s favorite snack), just to name a few. We’ve all heard of coat checks, right? 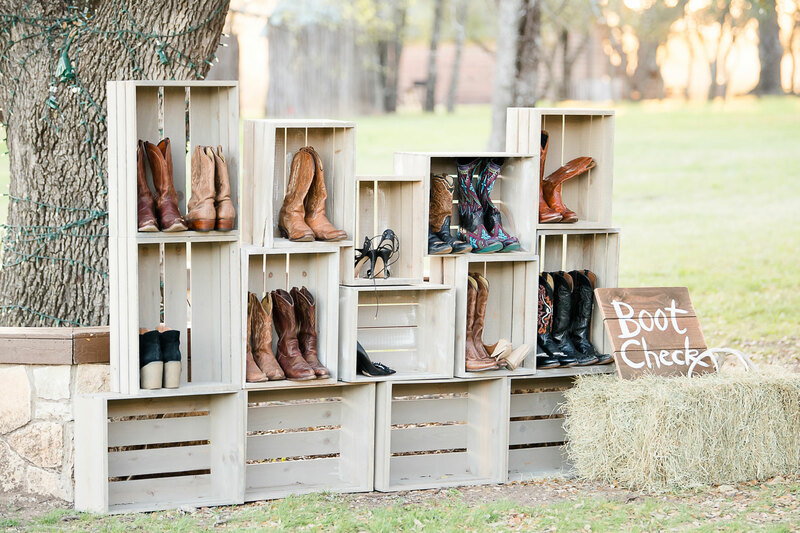 Well, welcome to Texas soirées where boot checks give guests the option to leave their Luccheses behind while they hit the dance floor and unwind! Who says there’s no horseplay allowed at a formal event? At a recent ranch wedding near Waco, our bride and groom provided horse treats for guests to feed to their favorite four-legged friends. Our couples have spirit, yes they do – and they frequently order custom cakes to prove it, too. 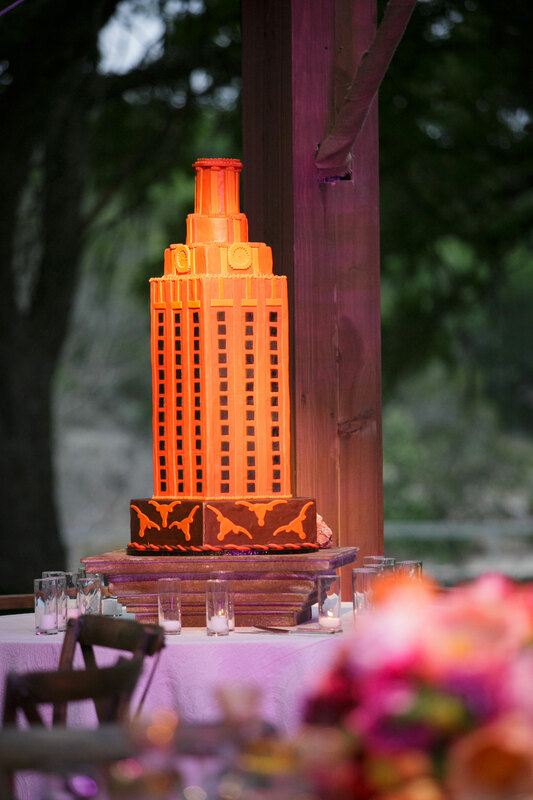 If the bride or groom attended a university in Texas – and that goes double for the University of Texas – you just might enjoy a buttercream-covered ode to their alma mater during the dessert course. That’s not to say that other local icons are off the (dessert) table, though. One of our couples took the concept of an “ice cream cake” to a whole new level by commissioning a replica of a Blue Bell Ice Cream container. Based in Brenham, Texas, the creamery has been in business since 1907 – and Texans have had a sweet spot for it ever since. Finally, when it comes to transportation, not just any stretch limo will do. But a bus emblazoned with the Dallas Cowboys star? That’s a touchdown, y’all! See more DFW Events weddings here, learn how wedding planning has changed in the last 20 years, and discover how to create an event space from the ground up.